I've been meaning to post this for about a month. And now, with the symbolic last day of summer I finally get to it. In my defense this summer, especially the last month and a half has been pretty crazy. Between visits from family, making the zine, doing the zine symposium and then for the last month dealing with a really bad back injury - I've had little time to catch up. I'm looking forward to some cooler weather and stronger days ahead. I've posted before about my mother and her amazing talents. She has been cranking out amazing quilts for the last couple of years. She never sells her work and it drives me crazy, because her stuff is so beautiful and well done. But, it takes a lot of work to do that and I can understand her not wanting to spend time on that. She'd rather sew! 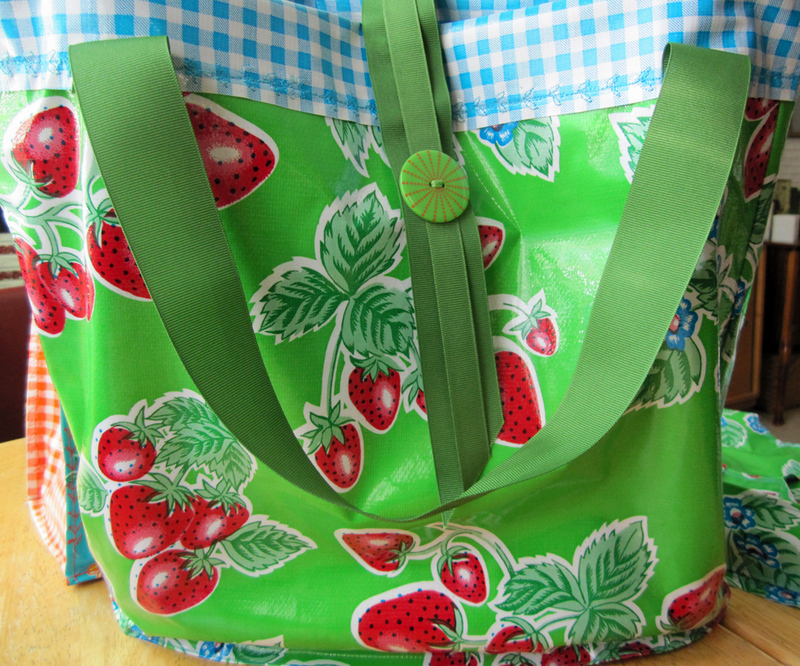 I spent a couple of weeks at the beginning of summer looking for a good lunch bag for work. I wanted Mexican oilcloth because it's easy to clean and so bright and cheery. I looked and looked on Etsy and there was nothing like what I wanted on there. I finally settled on something that wasn't what I wanted. Then I thought about my mom and how she could probably make one with her mad skills. 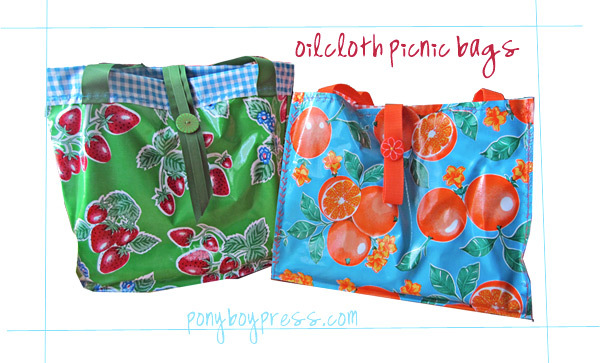 So, I bought some oilcloth online with contrasting gingham colors. So cute! I took it to her house with a placemat I liked, too. Hoping she could make me some customer round placemats as well (I forgot to take pics of those, but trust me they're awesome). 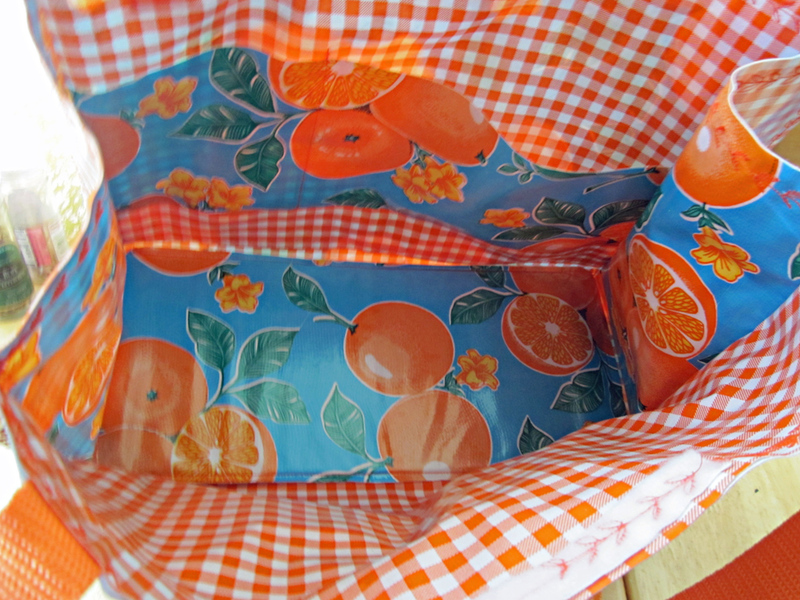 She was pretty unsure of working with oilcloth, especially since I wanted the liner to be oil cloth, too. I knew she would be able to do it and in fact she did quickly crank out some awesome lunch bags. She made them to my specifications, which were a little bigger than I probably needed. So, I use them more for picnics. And truthfully, they are so beautiful, I've been cautious about using them at all. In her usual fashion she added lots of sweet little features, including pockets inside and matching placemats and coasters for the bags! She used this stitch for everything and it worked great. 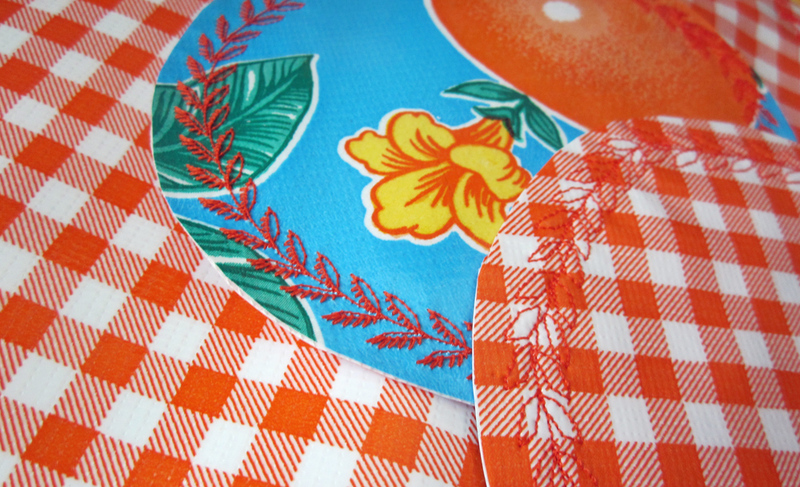 The cool, thing about oilcloth is that you can just leave the edges cut. It won't unravel. She took some cardboard and covered it to make the bottom more sturdy and flat. You can also remove it if you want. I can't offer you the directions for these bags, but something even better recently came out if you like the look of these totes. 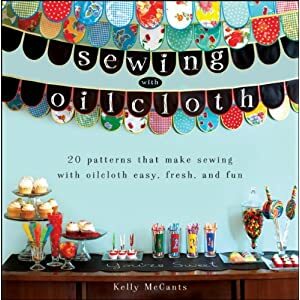 A new book called Sewing with Oilcloth is now out. 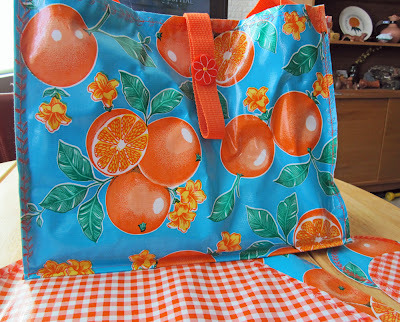 And you can get free patterns for the tote bag and the table runner. This book almost makes me want to sew! Those could be used for the new green grocery bags, too! What a great idea- and what a cute project! Going to have to try something like this myself!